As part of our Elevator Modernization the elevators and systems are being upgraded. Commencing on January 3, 2019 High Rise Elevator #2 will be shut down for approximately 12 weeks. A proposal for the Maritime Centre refreshing the façade of this iconic downtown building and enhancing the streetscape. Maritime Centre is home to the Atlantic region’s rapidly expanding pre-eminent tech start-up hub. Anchored by the leadership of Volta Labs which is currently scaling up to 60,000 square feet of space, some of the most exciting businesses, new ideas, job creation and innovations are coming from within the Maritime Centre’s walls daily. Volta is tripling in size to become the cornerstone of the innovation district in Halifax. 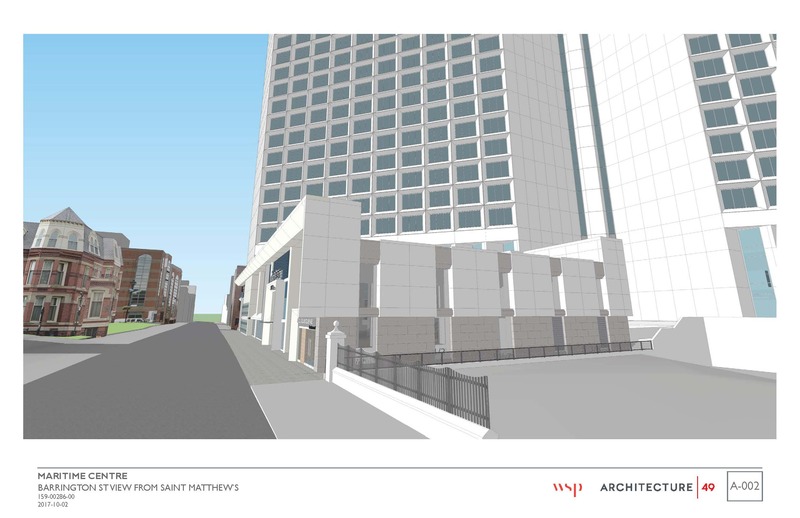 This new purpose-built space will be a true super hub for the technology industry to work and connect in Downtown Halifax. Last fall (2016) SLATE’s team of planners and architects at WSP and A49 presented a preliminary schematic design package to Halifax’s Design Review Committee (DRC) for their consideration. As the process of review has evolved, DRC and City staff provided helpful feedback and our team has made a number of design amendments and improvements. We look forward to engaging with the public and stakeholders through the City of Halifax’s process of public consultation in the coming weeks. 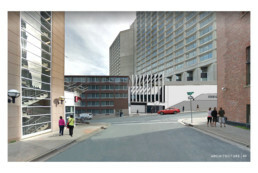 The Maritime Centre redesign brings new light to a bright corner in Halifax, refreshing the façade of this iconic downtown building by enhancing the streetscape, and as importantly, incorporating new wind mitigation measures to improve the sidewalk comfort for the thousands of pedestrians that walk past the building every week. The new Barrington Street entranceway design also enhances the building’s visual connection with Spring Garden Road. Central to supporting this important project is the needed garage expansion, which will enable 100 new parking spaces. 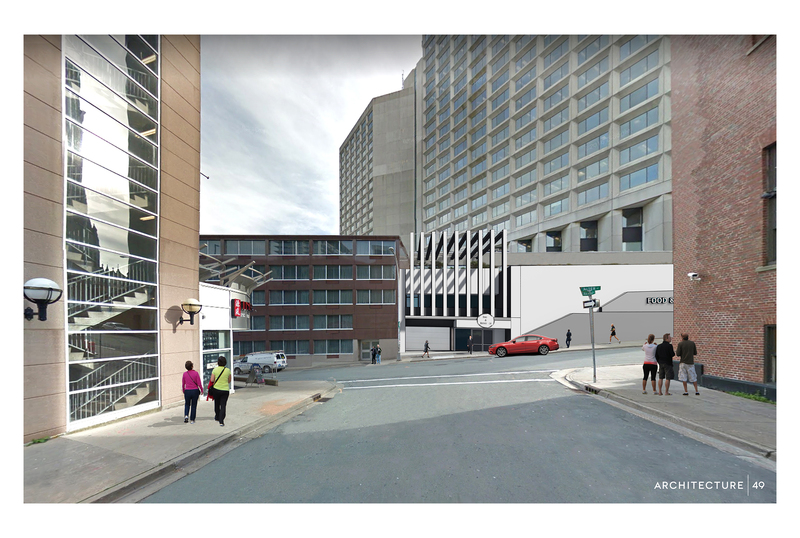 The project redesign and investment being made by SLATE hinges on the added parking space, an asset that is also needed in this growing area of downtown Halifax. An exit-only garage doorway is incorporated into the Salter and Granville Street side of the building. The traffic study confirms this design aspect will not have any significant impact on the traffic performance of streets or intersections near the site. 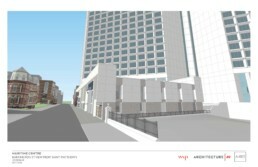 The project has two view termini: one at the end of Spring Garden Road and a second at the end of Granville at Salter Street. 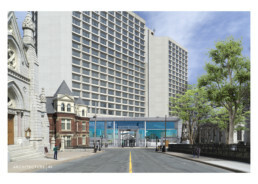 The design creates an improved connection at the end of Spring Garden Road with a contemporary archway terminating the view. A new design for the Granville Street terminus is a significant improvement on the existing condition, providing increased alignment with the S-1 View terminus Guideline using architectural treatment with strong vertical expression aligned to the view axis. The proposed new design addresses the Granville View Terminus by balancing the restrictions of renovating the existing building which requires a garage entrance and incorporates an improvement to the view terminus where there is presently none. 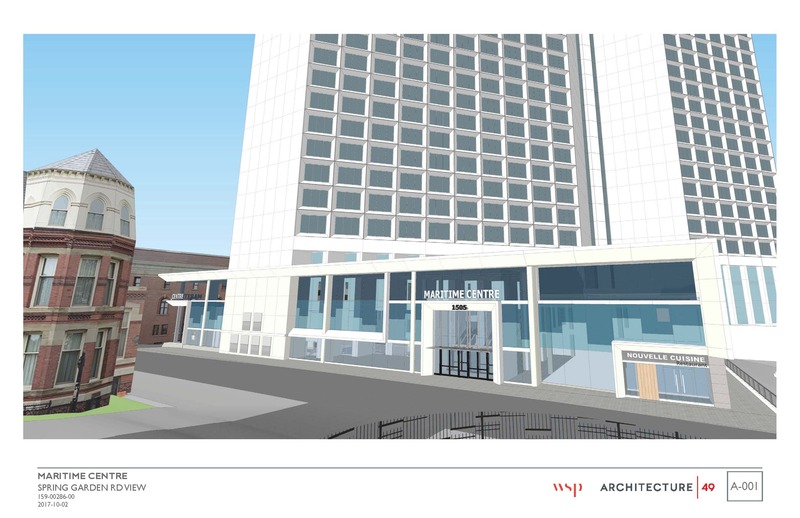 A completely redesigned entrance pavilion will bring more natural light inside the building on the main floors, energizing businesses and visitors. Thoughtfully designed entrances will increase access and invite people into the space. Refreshed seating areas will ensure a comfortable and enjoyable visitor experience. A Unique coloured glass will complement the stained glass of our neighbour, St. Matthew’s United Church, respectful of its historic place in our community. #4 – The elevator cabs will be getting a face lift and the operation of the elevators will be modified to a destination dispatch system. This will eliminate the need to go down to the lobby from one of the upper floors in order to go back up to one of the lower floors and vice versa. As a result, we will have the two high rise elevators shut down for two weeks. We will update if this is going to take any longer as we progress along. We currently have the block wall removed on the 10th floor behind the hoarding and will be installing the 2 steel frames for the elevator doors followed by re-instating the block work before removing the hoarding. #3 – The New Niche Lounge now open in their new premises. Accessible via the entrance at the corner of Salter and Barrington Streets after hours. Niche is offering a new breakfast & brunch menu as well as a new lunch and dinner menu. Happy hour starts at 4 pm. Take out available and they will deliver within the Maritime Centre between 11 am – 10 pm. Niche is also offering a Grab & Go Coffee and Snack service from 9 am – 3 pm. #2 – B-2 Level Food Court is closed as of July 1, 2018. Dr. Daniel Tam Dentistry and Niche Lounge will remain open during construction. 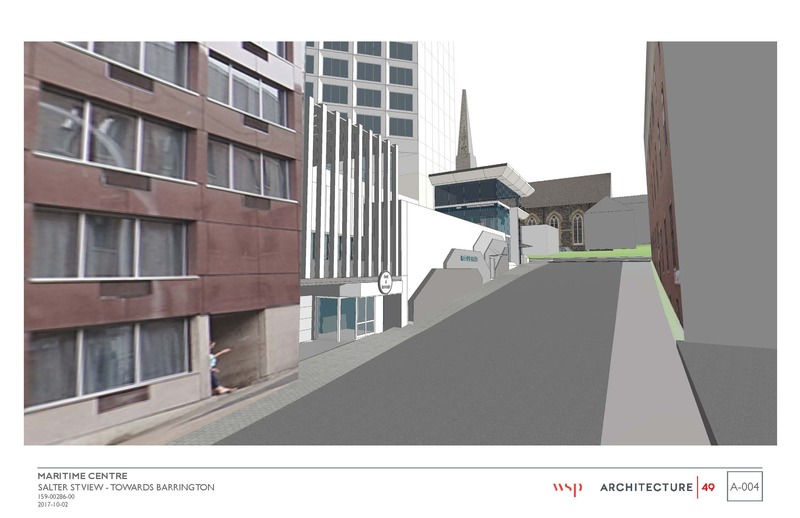 a) the proposed garage door at Salter Street not be permitted unless additional distinctive architectural treatment is included to comply with Visual Terminus obligations in the Design Manual. Craig Mosher, Partner at architecture49 has led the design of this project. The planning team is led by WSP Planning’s Jeffry Haggett. How is the building design reducing the wind tunnel effect that has long been associated with this building? Working with wind engineers, the cornice overhang on Salter and Barrington is designed as a lid that captures air flowing down the face of the building. It tends to force wind to break around the corners of the building at a higher level, not at sidewalk level. This measure improves wind velocities and provides a noticeable relief at street level compared to existing conditions. We were careful to preserve and reference the original cast design, which is famous in office buildings across the country, but also add contemporary elements that ensure flow, access and interesting light elements. How does this fit into the overall downtown landscape? We consider this a continuation of the very positive design story that is happening in our city, which has obviously been very well established with the Halifax Central Library. 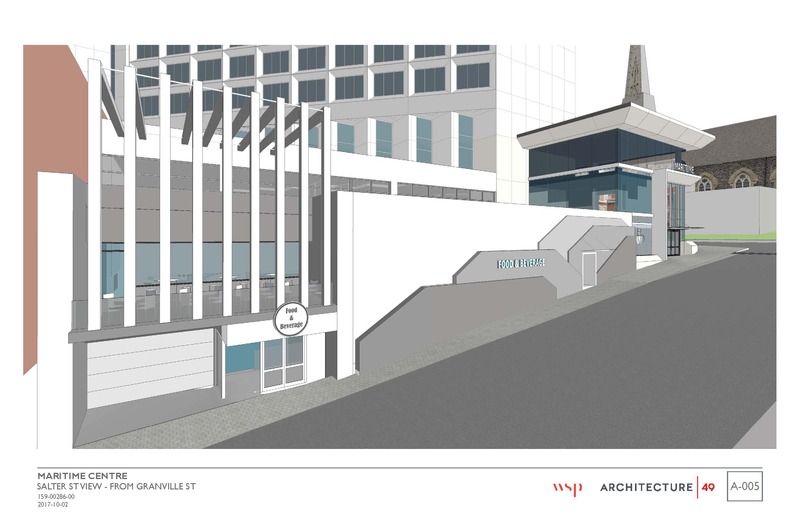 Our number one objective is to create a space that offers access to the vibrancy and life that is happening in the city and generate interest in the building to make it a natural part of the downtown streetscape, and a corner that sees among the highest volume of pedestrian traffic in the city. Are you concerned about impeding views or access? Our design adheres to all parameters in this regard. What happens if the parking lot exit on Salter at Granville is rejected by DRC and/or the city? 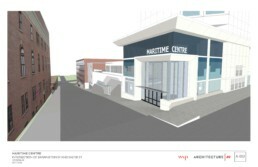 The project is bringing new energy and increased activity to the Maritime Centre. The additional parking and required vehicular exit on Salter is central element to the projects viability. Why can’t the current entrance and exit on Hollis street work for the added parkers? Will the exit have an impact on the traffic on Salter? The traffic study confirms this design aspect will not have any significant impact on the traffic performance of streets or intersections near the site. How has the design team been encouraging more alternate active transportation? Bike parking in the redevelopment has been expanded. 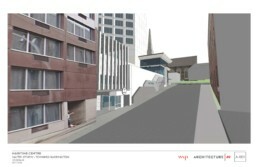 Twenty-five additional internal spots will be accessible from Hollis Street. How will this project impact downtown traffic flow? Cause noise? Dust? Other impacts? How will this project impact nearby street parking? It’s far too early in the process to know these details, but like all projects, we will make it a priority to cause as little disruption as possible. We’re planning to start construction once the design review process is complete, likely in early 2018. At this point, it’s too early to comment. We are focused on creating the most compelling commercial experience in the city, and early indicators of interest and tenant growth are positive. What will happen to existing tenants? Certainly with a change of this magnitude there will be some shifts and we think, for the better. We have already announced that we are moving Halifax Dance onto the main floor level of the building, providing expanded studio space and enhanced natural lighting for the students. We continue to engage existing tenants to discuss the best options and use of space. Who are the new tenants you are courting? We are exploring a range of options for tenants who we consider unique and who are interested in this new opportunity/area. We were thrilled to announce a few months ago that Volta Labs has committed to increased space to accommodate their growth trajectory. Who are the new tenants you’ve secured, given this investment? We can’t comment on this, given contractual constraints, but we’ll announce any important news, as we did with Halifax Dance and Volta, in the coming months. Are you at all nervous about the commercial competition in the region/city? On the contrary. We are making this investment because we understand the iconic nature of the building and its location. 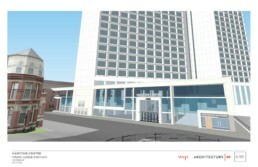 This renewal project will make it one of the most desired office spaces in the city.